Experience our luxury domed rail cars traveling roundtrip from Anchorage. 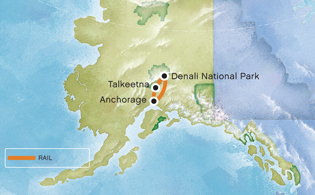 With a night at Denali National Park, and a night at Mt. McKinley Princess Wilderness Lodge there’s ample time to experience the abundant wildlife and to visit viewpoints for the "Great One".